The cutting edge of scientific reporting . . . Nowhere is creative scientific talent busier than in the world of inorganic chemistry experimentation. Progress in Inorganic Chemistry continues in its tradition of being the most respected avenue for exchanging innovative research. This series provides inorganic chemists and materials scientists with a forum for critical, authoritative evaluations of advances in every area of the discipline. With contributions from internationally renowned chemists, this latest volume offers an in-depth, far-ranging examination of the changing face of the field, providing a tantalizing glimpse of the emerging state of the science. "This series is distinguished not only by its scope and breadth, but also by the depth and quality of the reviews." 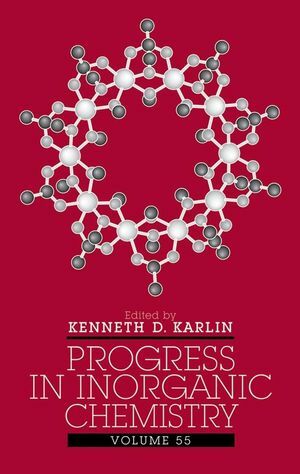 "[This series] has won a deservedly honored place on the bookshelf of the chemist attempting to keep afloat in the torrent of original papers on inorganic chemistry." Kenneth D. Karlin, PhD, is Ira Remsen Chair in Chemistry and Professor of Chemistry at Johns Hopkins University. He received his PhD from Columbia University. Chapter 1 Elucidation of Electron-Transfer Pathways in Copper and Iron Proteins by Pulse Radiolysis Experiments (OLE FARVER AND ISRAEL PECHT). Chapter 2 Peptide- or Protein-Cleaving Agents Based on Metal Complexes (WOO SUK CHEI AND JUNGHUN SUH). Chapter 3 Coordination Polymers of the Lanthanide Elements: A Structural Survey (DANIEL T. dE LILL AND CHRISTOPHER L. CAHILL). Chapter 4 Supramolecular Chemistry of Gases (DMITRY M. RUDKEVICH). Chapter 5 The Organometallic Chemistry of Rh-, Ir-, Pd-, and Pt-Based Radicals: Higher Valent Species (BAS dE BRUIN, DENNIS G. H. HETTERSCHEID, ARJAN J. J. KOEKKOEK, AND HANSJO¨ RG GRU¨ TZMACHER). Chapter 6 Unique Metal–Diyne, –Enyne, and –Enediyne Complexes: Part of the Remarkably Diverse World of Metal–Alkyne Chemistry (SIBAPRASAD BHATTACHARYYA, SANGITA, AND JEFFREY M. ZALESKI). Chapter 7 Oxygen Activation Chemistry of Pacman and Hangman Porphyrin Architectures Based on Xanthene and Dibenzofuran Spacers (JOEL ROSENTHAL AND DANIEL G. NOCERA). Chapter 8 Metal-Containing Nucleic Acid Structures Based on Synergetic Hydrogen and Coordination Bonding (WEI HE, RAPHAEL M. FRANZINI, AND CATALINA ACHIM). Chapter 9 Bispidine Coordination Chemistry (PETER COMBA, MARION KERSCHER, AND WOLFGANG SCHIEK).